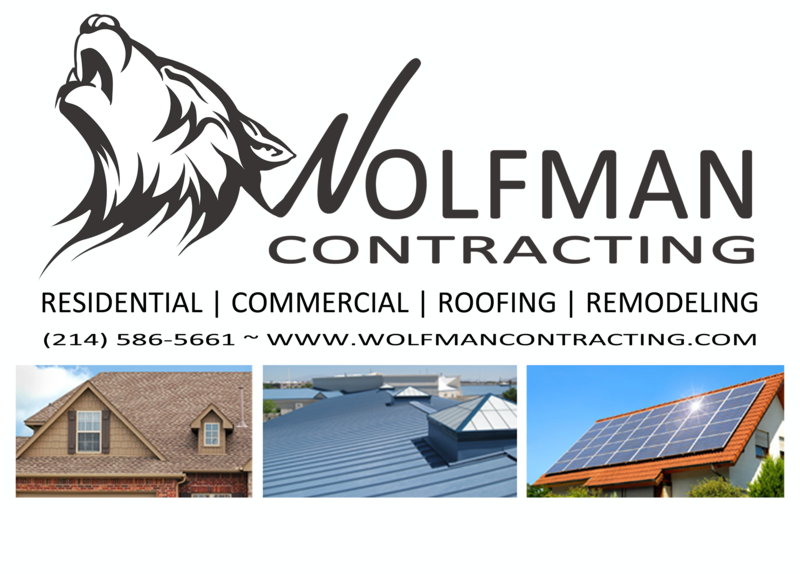 Wolfman Contracting located in Mesquite, Texas has been a leading roofing company in Dallas and Ft. Worth Areas for both commercial and residential. Wolfman has earned the trust of home and business owners alike for the past several decades and prides itself on treating customers the way they ought to be treated. When a customer calls Wolfman to do a job, it is usually after hail or windstorms. Many cases traumatic events such as North Texas Tornados have devastated neighborhood businesses and homes. The last thing someone wants to deal with is trying to find a trustworthy contractor to do the job right. All too often, there are companies that take advantage of these misfortunes. Wolfman Contracting is a pleasant relieve during their customers time of need. Wolfman is able to deal with the insurance adjusters and help their clients finance a thorough job often finding additional resources to complete desired remodeling projects such as fence and patio repair. The Wolfman Promise allows home and business owners to relax and know they are in good hands. The Wolfman Team treats your property just like it were their own prompting many satisfied customers to sing their praises. To experience the Wolfman Contracting difference; call (214) 586-5661 or visit the website at www.wolfmancontracting.com.